At the time of writing, live dealer keno is no longer available at G’day online casino – we will keep posted with any new information regarding the live variant. You can check out the online keno page for a range of RNG games, however. 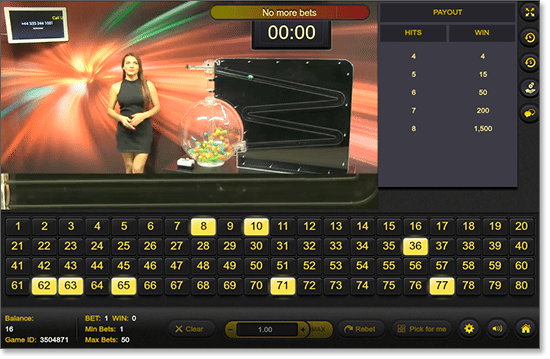 Unlike the standard video keno games found at your local pub or club, live keno sees a traditional live draw using a barrel full of numbered balls – there is no random number generator (RNG) involved. High Definition video streaming, a simple online betting interface, and fun, friendly croupiers make this a must-try for fans of real cash keno games. Ezugi is the only software provider to offer this unique live dealer title – live dealer specialists stick the standard blackjack, roulette, and poker. You can find Ezugi at one of our top-rated real money sites, G’day Casino. You can read what other games, including live dealer tables, the casino hosts in our review here. Live keno is only available in real money mode – so sign up now at G’Day Casino and make your first deposit to snag an unlimited 100% cash bonus and 50 free spins to use on the pokies. Real money: As mentioned above, you can only play live dealer games with real casino credits. This is because the games are much more expensive to run than your standard RNG titles – free play simply isn’t cost effective. G’Day offers several trusted deposit methods – such as Visa, MasterCard, Neteller, Skrill, and paysafecard – which are all safeguarded by 128-bit Secure Socket Layer (SSL) and Transport Layer Security (TLS) connection digital encryptions for maximum online banking security. High-speed Internet: To get the very most out of your live dealer experience, you need a fast and reliable Internet connection. As a rough rule, we would say you need ADSL1 or better. You can make do with a less advanced setup, but the video quality will suffer and regular mid-game dropouts could become an issue. You can decrease the video quality if this is the case. Ensure you are all logged in and your account balance has been topped up and then click on the ‘Live Casino’ option under the ‘Game Categories’ section on the left of the page. You will then notice the ‘Live Keno’ table – click on that and you can get playing. It is important to note you need your popups enabled as the title appears in a separate browser. If the live dealer menu does not appear, check your computer’s security settings, ensure the Firewall isn’t preventing all popup windows, and try again. Once the Live Keno window has loaded, the video feed will appear, with the betting layout across the bottom along with the action bar – here you can adjust stakes, make bets, etc. There’s also a display in the top right, where we can view payouts, bet history, live chat, and more. If you enter a Live Keno room between plays, the video screen will show a timer counting down to the next round. Drawings take place every three minutes and all bets must be placed before the timer reaches zero, at which point the HD video stream will return to the casino floor for the live draw. Ezugi’s live dealer keno game is played with 80 balls, numbered 1 to 80, of which 20 are drawn each round. We can cover up to eight numbers per drawing, with a minimum stake of $1 and a maximum bet of $50. Payout odds are shown in the top right of the screen as you select your numbers, and will fluctuate depending on how many you decide to cover. For example: if we choose to cover two balls with a $1 bet, the display shows a return of $1 for one number and $6 should both be drawn; but if we cover three balls, the odds will be $3 for two hits and $25 for three, with no return for a single number. However, we must hit at least four winners in order to earn a dividend when playing this many spots. To select your balls, simply click on the corresponding numbers on the layout, or opt for eight random numbers by clicking ‘Pick For Me’ – and you’re done. There is no other confirmation process required, so just sit back and wait for the draw. All bets are confirmed as soon as the timer hits zero, so it helps to make sure you’ve got your stakes and selections in well before time. As with anything that is 100% live, once in a while you might experience a minor mishap while playing live casino keno. Anything out of the ordinary which compromises the integrity of the round will usually result in a replay, with all numbers returned to the barrel and all results for that round declared null and void. If you want clarification on such procedures, or need help with a specific issue – be it technical, gameplay-related, or otherwise – you can contact the G’day help desk via live chat or email seven days a week. Find out how the ladies can score a 40 per cent bonus match up to $100 every Monday night at SlotsMillion Casino. Log in at JoeFortune.com any day this week and trigger not one, but two match deposit bonuses up to $50 each. Find out how you can score up to $300 bonus cash this Friday at Mucho Vegas Casino. Find out how you can earn cashback deals, extra deposit matches and heaps more exclusive perks by betting with real money at Joe Fortune Casino.